New ! 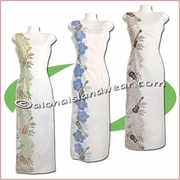 stylish and elegant Hawaiian long paradise dress features a solid color with beautiful tropical flowers on right side, it's similar with the Hawaiian long tank dress, it's designed on round neckline, sleeveless, back zipper, ankle length and slip on both sides, high quality light-weight fabric is comfortable feel. 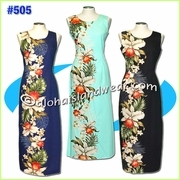 This style Hawaiian dress is great for Hawaiian wedding, beach luau party, senior prom, family reunion, work, travel. Matching Hawaiian Shirts are available on most patterns.